The location is extremely strategic in that it provides easy access to locations and the Airport. The beaches are nearby & they are the best located. 1) Location: Tahiti is right across the Total garage and just a short walk from the beach. Very close to Spar for ones Masi needs. So I liked that I was able to help my parents across to the beach without much fuss. 2) The accommodation was clean, and generally not too far off from that described in the listing. 3) Beach view from the front door. 4) Allocated parking per tenant. Close to the shops. And the outside maintenance of the building and gardens. Located 350 feet from the beach in Umdloti, Tahiti 10 is a 3-bedroom apartment with terrace and garden view. Free private parking is available on site. The spacious and air-conditioned unit has an open plan living area with sofa and a TV with selected satellite channels. The kitchen is fully equipped and includes a breakfast counter. The unit has 2 bathrooms. The complex has an outdoor pool and barbecue facilities for guests to enjoy. Restaurants and shops are within walking distance. 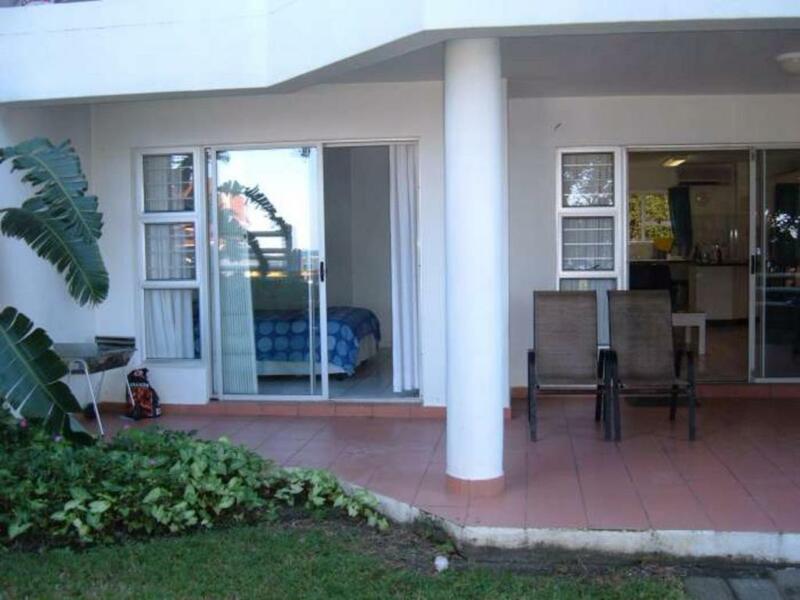 The nearest airport is King Shaka International Airport, 15 minutes' drive from the property. When would you like to stay at Tahiti 10? This apartment has 3 bedrooms and a terrace with garden view. It offers a fully equipped kitchen and a lounge area. House Rules Tahiti 10 takes special requests – add in the next step! A ZAR1500 damage deposit is required 30 days before arrival (about USD105.79). This deposit will be fully refunded 7 days after check-out, as long as there isn't any damage to the property. Tahiti 10 accepts these cards and reserves the right to temporarily hold an amount prior to arrival. A damage deposit of ZAR 1500 is required. The host charges this 30 days before arrival. That's about 105.79USD. This will be collected by credit card. You should be reimbursed within 7 days of check-out. Your deposit will be refunded in full by credit card, subject to an inspection of the property. 1) Instructions were sent via email to let us know where to fetch keys during office hours, but no information was given regarding where to collect keys after 17h00. Also, we had experienced problems with the rental company at the airport, so we're running late. No effort was made by the estate agent regarding progress of our arrival. 2) No Wi-fi. I am aware that the booking.com listing stated the lack of Wi-fi, but this is something that should be provided. 3) We had no sleep the first night due to a noisy neighbour who was screaming in a drunken haze the entire night. 3) No fans in rooms. Only a single aircons in kitchen area. 4) Poorly maintained. Deep crack in the floor near the common bathroom. And one can actually feel a higher temperature on the floor in this area. Definitely a plumbing issue. Shower head is ancient. Not enough of water coming out of the shower due to defective showerhead. 5) No mosquito screen on windows to prevent mosquitoes. And there were lots of Mosquitoes. We used up 4 cans of Doom and 2 cans of repellent spray in a 4 day period. 6) Front door could not be locked from the outside. So we stuck to locking the gate only and just closing the door. Big enough for us, and wat we required. Not much, I think for the amount it was value for money. It was very nice. The location. They may consider replacing the braai and the mattress of the second bedroom's double bed. In 2 weeks I had a cleaning service 4 times for 10 minutes each time. No tumble dryer. And bed linen was old and with stains, cushions where very dirty and the floor mats, curtains dirty as well. Oven couldn’t use was very dirty. For the price I paid I expected the place to be better. The crockery was very limited. Would be nice to have things like milk jug, more casseroles, other necessities in The kitchen. the shower door ws broken and 6 people had to share the other one, I did report it but the person told me that no handyman was available to fix it.